It’s not great when you work so hard writing a blog post and can’t find it anywhere on the first page of Google. It affects your overall traffic and conversion. Well, the good news is, you don’t have to hire any experts to get you to the top. In this quick tutorial, I’ll show you how to get high ranking on Google by making some changes to your post and using some great tools. First, What’s Your Page Ranking Like? In order to improve your page or post ranking, you must first know the current ranking for the keywords that you are targeting. If you haven’t been doing a proper keyword research, it’s high time you start because that will give the article a focus point and as you elaborate around the topic, it will indirectly generate other relevant keywords that can contribute to the overall indexing and ranking process. There are a few online tools that you can use to check for page ranking such as Google Webmaster and SERPs, but my favourite one is Jaaxy because it doesn’t require any interpretation in terms of graphs or other complicated data. I wrote a post about making money with Amazon some time ago and according to Jaaxy, that article was sitting at the far end of Page 2. So obviously, it needs a little more push to get into Page 1. Before we get started, we’ll have to prepare a checklist of the things that we want to fix. For this, I would recommend that you use Google Spreadsheets because it’s free and has a great auto saving mode. We are going to call this sheet ‘Post SEO Audit’. As mentioned previously, you should have one targeted keywords per article and ideally, they should make human sense, descriptive and minimally competitive. Your content is going to revolve around this keyword so learning the proper method of research is very important. This keyword will sit in the first column of the spreadsheet, followed by other elements that we are going to change shortly. Audit #2 – What’s in the URL? This is also known as the permalink. It is a web address that leads to an article so whenever someone search for example “Learn Affiliate Marketing” (the targeted keywords), the URL should contain these words so that Google can identify and returned that particular page to the users. Just stick with the original permalink and improved on your blog content (which I’ll show you in the following steps). Change the permalink using a 301 redirect plugin. In the third column, you want to key in the current page ranking (for example; Position 101, Page 11) so that you’ll know how many positions you have moved after completing the SEO audit. When you come back to check on the page in a few weeks time, key in the new ranking in the fourth column. Whenever Google crawls a web page, it will try to capture a snippet of the article by ‘reading’ the page title and meta description to see if the article is relevant to the user’s query. In case you don’t know what this is, here’s what a search preview looks like for an indexed web page. As you can see, it displays the keywords (bold) on the page title, the URL as well as a unique meta description. I call it unique because you can see that the webmaster had taken the time to briefly described what the page is all about, instead of relying on Google to randomly select snippets from the page content. When you have a well designed meta description, you will earn a better ranking on Google for providing helpful information for the users. If you are using WordPress for your website (which is my recommendation), you can fill out this information using SEO plugins such as All in One SEO or Yoast. Say you are just starting a conversation with your audience; would you jump straight into the main discussion or do a little brief introduction first? I think you would agree that the latter is a better approach. The first paragraph of your content is like an introduction and more often than not, it gives the readers a reason to stay on (or to leave) your page. The factor really boils down to how you use the targeted keywords to create a strong impression so do learn to sprinkle them a bit on the first paragraph. Alt Text aka ‘alternative information’ was originally used to describe images for users who disabled them on their browsers. Although most people hardly do this anymore in this time and era, it still serves as a function to inform Google what an image is all about. By adding relevant pictures, you are also helping the readers understand the content better and Google will know this by reading the Alt Text. 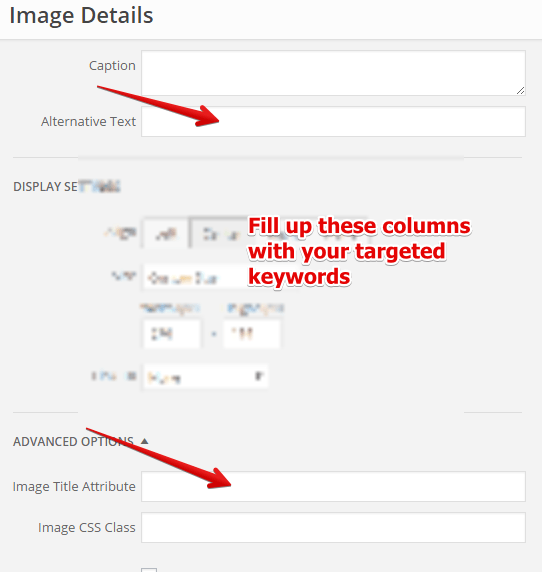 You should also consider doing the same thing for the Image Title Attribute as well because it serves as an ‘additional information’ on top of the Alt Text. As long as you describe the image as accurately as possible using your targeted keywords, Google will do its best in ranking that page. If you are wondering where to source for images, I highly recommend that you check out Photopin (they are free to use!). In the previous six audits, we discuss about why and where you should include keywords to get better page ranking. Now, we are going to talk about other SEO techniques that does not focus on keywords. After writing a few articles, you’ll find that some information will overlap with one another. This is a good thing because it creates an anchor for you to connect two or three (or more) articles through internal (within your website) and external (to other websites) link. Although links can potentially take readers away from a certain page, it also guides Google Spider to check out other important pages and pass the link juice aka ranking power to those URLs. However, you don’t want to always be using the exact keywords in the post title as the anchor text as this can be seen as spamming by the search algorithm. Try to diversify the words and let them read naturally. Who doesn’t like watching videos these days, right? The fact that they are engaging and informative can potentially influence readers to stay longer on your page. If you can create and publish your own videos, coming up with a well designed video description (sprinkled with targeted keywords) will send ranking signals similar to blogs with meta descriptions. Even if you are merely embedding other people’s video (with permission, of course), this can make your content more interesting to read and indirectly boost the page ranking as a result of social shares and comments. Great places to source for shareable videos are YouTube and Vimeo. One thing that I look forward to every day is to receive notifications of comments for my blog. I love hearing opinions, questions and sometimes, constructive criticism from my readers because I think it keeps the discussion area healthy and make me a more well-rounded writer. As it turns out, Google loves this kind of engagement too. If your blog isn’t getting enough good quality comments, I would recommend that you check out SiteComments, a blogging platform that helps niche bloggers boost comment engagement and social shares for their site. 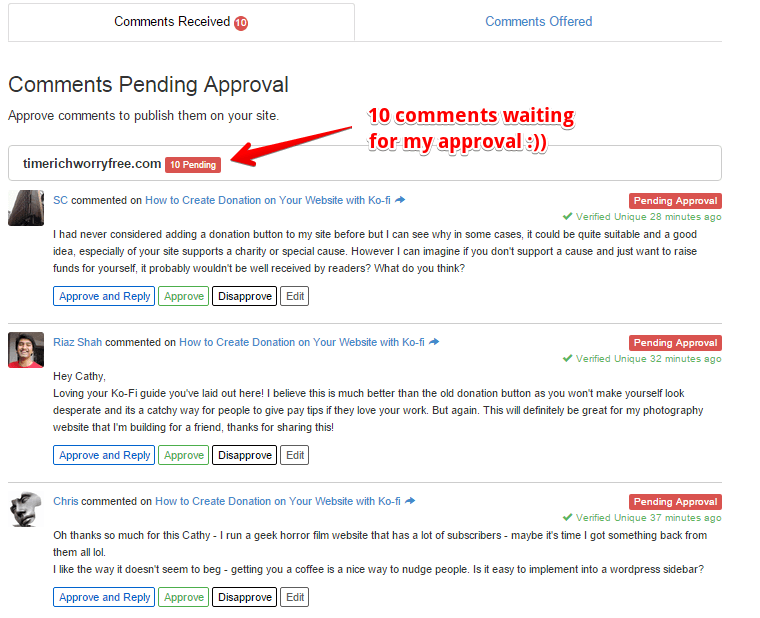 For example, within days of publishing a post, I received 10 great comments (and more to come) from other bloggers. Of course, I reciprocated with my own comments on their sites as well. After getting comments on the post, make an effort to share it across your favorite social networks. The more it gets passed around, the more it would be read by other people. Make sure that you optimize the social settings in your SEO plugin as well. I personally like Pinterest and Google Plus because they have more visual appeal and I find that the communities in these networks are more genuine with their interaction. At this point, you have basically given your posts, a big website overhaul. 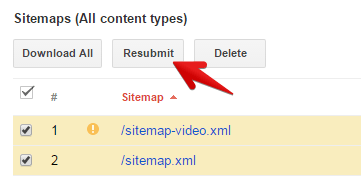 With all the changes, it’s best to resubmit your sitemap to refresh Google’s crawl to your website and hopefully, some of the page rankings will start to pick up soon. Last, but not least, you should put a date stamp when you have completed the SEO audit for one targeted keywords so that you can come back in a week or two to compare the position ranking. It may be wise to add an additional column for personal notes such as ‘Add more images’, ‘Create a video’ or if you are up for the challenge, ‘Rewrite the entire post’. Anything you think can help to improve on the content, but might take a little longer to fix, is worth writing down as a reminder. So, Did My Ranking Improve? After I performed all the 12 audits, here’s the current ranking for my Amazon post. SEO audit is nothing more than optimizing your pages for a better user experience. Google is just merely guiding you towards the right direction. So don’t do it for Google. Do it for your readers and your posts will get a lot of Google love as a result of that. If you are wondering where I learn all this great SEO tips, check out the following webinar by Jay from Wealthy Affiliate. Do you have any suggestions or questions about this topic? Please leave your comment below and I’ll get back to you. Wow, these are some helpful tips. I have been thinking of creating a website and was concerned about getting ranked on Google. At first, I thought of hiring some professional people to help me search for keywords, but that was too costly for a beginner like me. This post is certainly going to help me out. Thanks! Hey Jose, there are a lot of people that provide such services for a fee. If they are professional, that’s fine. But there are also scam products that claim to do the same thing. Just remember to do your due diligence if you ever want to engage with those type of services. Otherwise, the tips that I’ve offered here is more than enough to help you get started. You should also check out Jay’s Webinar for more detailed information. This post had a ton of great information. I think the parts I liked the most were the parts about the meta description, the importance of getting blog comments, and the date stamps. Do you find that you can often get your new post to the number 1 ranking on Google? Hey Nick, it’s not surprising to see newly published post ranked on the first page of Google for your targeted keywords, but it takes a lot of effort to maintain it there. Things like internal linking, adding more content and getting engagement – these are some of the factors that can continuously boost the rankings of your blogs. 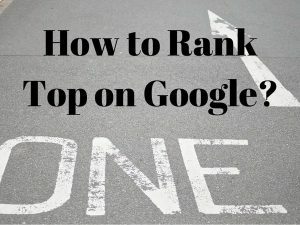 Wow, this was a lot of info on how to get ranked in Google. This seems to be what I need as I am building content slowly but surely but I have problems getting it ranked. How about building backlinks? I have read that backlinks from, for example, article directories are no longer effective. But what about links from relevant sites? For example if you made a comment on another site and you linked back to your own site. Would that help your Google rankings? Hi Jojo, I wouldn’t deliberately ‘build backlinks’ for the sake of ranking. If it happens naturally, then that’s fine. This is because Google search algorithm has improvised and doesn’t put a lot of weight on this metric anymore. You can read more about it in this blog written by an experienced online marketer. Excellent post! I have been writing posts and pages and building websites for over a year and what you submitted here reinforces what I learned and know. It also rebukes me for being lazy and adding a picture or two without Alt Tags. I’m bad! I know I can do better. I am so glad I came across this post on Google ranking! I’m just curious, how do I really check my current ranking? I do have Google Analytics which is kind of Greek to me, and I don’t see how I am supposed to use that to get my website ranked higher. Sometimes I have a hard time incorporating the “keywords” which I use in the title, into the body of the first paragraph. Is that totally required, or okay that I don’t? I use more keywords besides just the ones in the title. Is that okay? 1) An easy way to find out your current page ranking is to go into Google Console > Search Analytics and checked this box like so. If you look below the list, you’ll be able to see the number of clicks and position (aka current ranking) on the right hand side, correlating to each webpages. There are other free tools like Google Rank Checker that does this, but I found that there’s a huge discrepancy from paid tools for positions that are on page 2 and beyond. Alternatively, you can take advantage of Jaaxy’s 30 free searches to find out your page ranking. 2) I face the same problem too sometimes, trying to get the keywords to fit into the first paragraph, but I eventually found my way. I would try my best if I were you because it will improve the chances of that page being indexed. For each page/article/content, I would only target one keywords. That seems to be the rule of thumb when it comes to SEO and I think it helps me to focus on what I really want to convey to my readers. Loved the fact that you shouted out Jay towards the end. He really has helped my business grow over the last few months. His webinars are a gold mine of information. A big factor for me was the SERPS, as well as the content itself. I think it’s important for people to know that you want to be as helpful and thorough as possible. After all, people are online digging for information first and foremost. Honestly I could go into a lot more minute detail, but instead I’ll end with the question. In your opinion, is Jaaxy worth the money/upgrade over the WA keyword tool? Thanks for your questions Stu. I was using WA Keyword Tool for a while before I convert to Jaaxy. Keyword data wise, there’s not much difference between the two. Many WA members use the basic keyword tool and they managed to achieve high rankings as well as good conversion too. The reason I moved onto Jaaxy was because 1) I could afford it and 2) it displays the data faster which is what I prefer for my blogging routine. Since I am a visual person, I find that the data are much more easier to digest with the color coded KQI. Not to mention that the SiteRank is also a cool feature to use. For me, Jaaxy is worth the upgrade if your budget allows. If not, the WA keyword tool works just as great – minus all the bells and whistle. I like this topic so much and I believe it will help me and any website owner get top ranking in google searches. I also like you have presented the process step by step. They are really helpful. But with Jaaxy, the free membership is quite a limitation for business owners. They can extend for free members freebies or what do you think? As a starter member, you’ll get 30 free trials with Jaaxy. That’s good enough to run keyword research for at least 5 to 6 blog topic ideas, if you allocate about 5 brainstorming session per keywords. Apply all these SEO ranking tips using the chosen keywords and see how well the article performs. If you really like it, you can always upgrade to the Pro version or switch to using the free keyword tool within Wealthy Affiliate. It works just the same without the bells and whistles. Here’s the training that can help you out. Reading through you post just confirmed how little I know about SEO and how much I still have to learn. Simple things like alt text for images to more important things like meta description. Thanks for the wonderful read and fueling the fire for me to make more effort to learn more about SEO. I started out not knowing anything too, but you’ll get better at understanding this SEO thing as you move along the training. If you need any help, just give me a shout out within Wealthy Affiliate, okay. Wow this is a very detailed post, I love how transparent you are in showing a screenshot of your post, awesome to see that its on the first page! This makes me even more pumped up to work harder and tweak my posts to be more SEO-friendly. I particularly like the SiteComments feature, they revolutionize the way SEO works and helps the little people like us compete with the big sites. I remember those times when I had to pay $5 on Fiverr for very short and dishonest comments made by the people there, how time flies. Thanks for sharing this with us and hay! Thanks for always taking the time to visit and leave great comments on my blog. Getting top ranking on Google always seems to be the main discussion in Wealthy Affiliate and also in every blogger’s agenda. So I thought it would be good to address this topic with an example. However keep in mind that this is not always the case. There are other factors to consider such as keyword choices and off-page SEO elements. Having said that, I didn’t know that you can pay Fiverr for comments. Honestly, I rather use SiteComments which comes together with the training at Wealthy Affiliate as I know the members there actually take the time to read my article before posting a comment. I am so interested with SEO. What does it mean website not indexed on google. and what can someone do to get it indexed? Does google like affiliate links? Can affiliate links affect someone’s site? If so what should be done. I hope to get my answers from as I can see you get well knowledge about SEO. 1) To be indexed by Google is to have your web content known to Google search engine’s database. To find out, simply type site: yoursite.com into the search bar and you’ll know if the site is indexed or not. Create a SiteMap > Submit SiteMap to Google Webmaster Tools > Install Google Analytics and then Get Comment Engagement > Socially Share the Article. Repeat these steps for every content that you create and that should speed up the indexing process. 3) Google has no issue with affiliate links. Instead, it’s how the links are being used on a site that is perceived as ‘good’ or ‘bad’. 4) Affiliate links is somewhat regarded as external links so when you use it excessively on a webpage, especially during the initial stage of creating a website, it’s like sending the crawlers/ readers away from your site. This can have a negative impact on the page traffic and ranking. I hope this information helps. If you need more guidance, please feel free to drop me a private message at Wealthy Affiliate. I’ve just started my website and wanted to learn more about SEO and all the different strategies I can use to boost my google rankings. I can’t wait to start linking my content together and hopefully soon people find my content helpful enough to link it on their website. This is an awesome guide for SEO and I bookmarked it so I can come back and learn more. Good to know that you are working on creating quality content for your site. Internal linking is a very powerful element, just make sure that you are using proper and concise anchor text, link to relevant topics without over doing it and always use it simultaneously with your call-to-action.